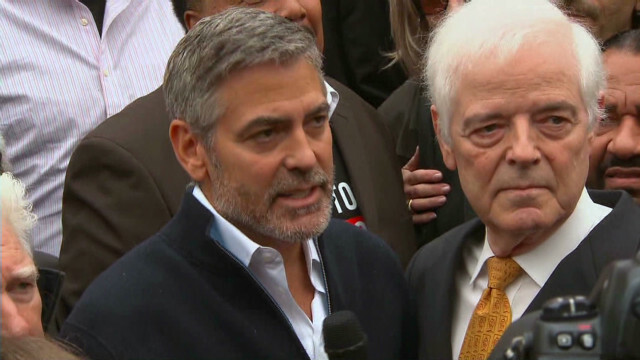 Washington (CNN) — Police place into custody actor George Clooney and others Friday during a protest at the Sudanese Embassy in Washington. The arrested protesters included congressmen, human rights activists and faith leaders. Those arrested included United to End Genocide President Tom Andrews; Democratic Reps. Jim McGovern, Al Green, Jim Moran and John Olver; Martin Luther King III; and NAACP President Ben Jealous. After speeches by several of the protest leaders, a police officer told the group she was giving them a third warning, after which they would be arrested. A few moments later, the arrests began. The group stood calmly as they waited for the police to apply plastic handcuffs as the crowd of protesters chanted “al-Bashir to the ICC,” referring to the International Criminal Court, where Sudanese President Omar al-Bashir has been indicted. Clooney was charged with disorderly crossing of a police line, a misdemeanor, Secret Service spokesman Max Millien said. The Secret Service is responsible for security at foreign diplomatic missions in Washington. He paid a $100 fine, choosing to forfeit that money to avoid a court appearance, said Gwendolyn Crump, a spokeswoman for the Metropolitan Police Department. Clooney met with President Obama on Thursday to discuss his concerns about Sudan. He testified before the Senate Foreign Relations Committee this week about violence in the Nuba Mountains in South Kordofan, a state in Sudan near its border with newly independent South Sudan. Clooney and other activists blame the Sudanese government for attacks there that have injured and killed civilians. Clooney told the Senate committee that the attacks are being orchestrated by Sudan’s government, led by al-Bashir, government official Ahmad Harun and Defense Minister Abdelrahim Mohamed Hussein — the same three men, he said, who orchestrated long-documented attacks in Darfur. This month the International Criminal Court issued an arrest warrant for Hussein, listing 41 counts of crimes against humanity and war crimes allegedly committed in the Darfur region of Sudan. Al-Bashir and Harun are also facing war crimes charges involving Darfur. Clooney is co-founder of the Satellite Sentinel Project, which uses satellite imagery to watch for aerial attacks and troop movements in Sudan and South Sudan, which became a separate country last year.